In their English classes, our seniors participate in an iteration of the graduation project we dubbed Project Connect. Guided by principles of Connected Learning, we designed the project to teach students to connect, to learn, to make, and to compose. Our previous version of this project required students to work face to face with mentors for a minimum of 15 hours, all documented and regularly falsified. Documentation and mandatory mentorships this time around was neither a desire nor an option, as our principal forbid it based on the fact that such requirements were much harder for our disadvantaged populations to fulfill and often led to their failure. What we really wanted to accomplish this time around was to help students to make interpersonal and community connections, online or face-to-face, so that they could pursue learning independently. Doing so would not be so easy. For some students, those networks arise naturally. Their parents are doctors with doctor friends that match their own interests in medicine, for example. For most students, however, such connections are unlikely. Instead of forcing students to choose projects and papers based on the skills of the people who had the time and skill to mentor them–and for students of poverty, such connections were always elusive–we wanted them to find whatever degree of help they could from whatever knowledgeable people they could access. Under our old model, a student with limited transportation who worked in the evenings and lived in a low income neighborhood, but who wanted to learn the art of making sushi, was unlikely to pursue her desired topic simply because of her limited access to mentors. Under the Project Connect model, that same student could learn to make sushi using whatever resources she could access, including digital media, and was, therefore, more likely to choose her favorite topic. This is no small matter, either. A project that feigns open topic selection but impedes that selection for so many of its students only disenfranchises those students. I wish we could say that our expectations for Project Connect were fulfilled in its first year, that all students pursued topics of their choice and found themselves meaningfully connected to mentors and people knowledgeable in their topic, but success was only partial. Part of what we discovered after a year invested in Project Connect was that many of those students who struggled to fulfill mentor requirements were struggling once again. In part, this was a lack of motivation to fulfill an expectation with no real weight behind it; in part it was a lack of skill in making these connections. That is to say, teachers guided their students to some extent toward these connections with informal mentors, but since such connections were neither formalized nor required, they were not valued the way MLA style citation of a minimum number of sources in a bibliography might be. And, since these connections were not fully valued, little emphasis was placed on developing the skills necessary to make connections with real people in a digital age, most students did not actually develop, either actively or passively, this incredibly important skill. And here lies the purpose behind this product. My flow map in no way solves our problem. It won’t connect anyone with anyone, and it certainly won’t create motivation where none previously existed. Instead, it attempts to provide a loose sequence of steps for getting connected. It implies that all participants should seek connections to knowledgeable people, and that they should use the human (teachers, friends, family members) and digital (Twitter, Google+, Facebook) resources available to them to initiate those contacts. 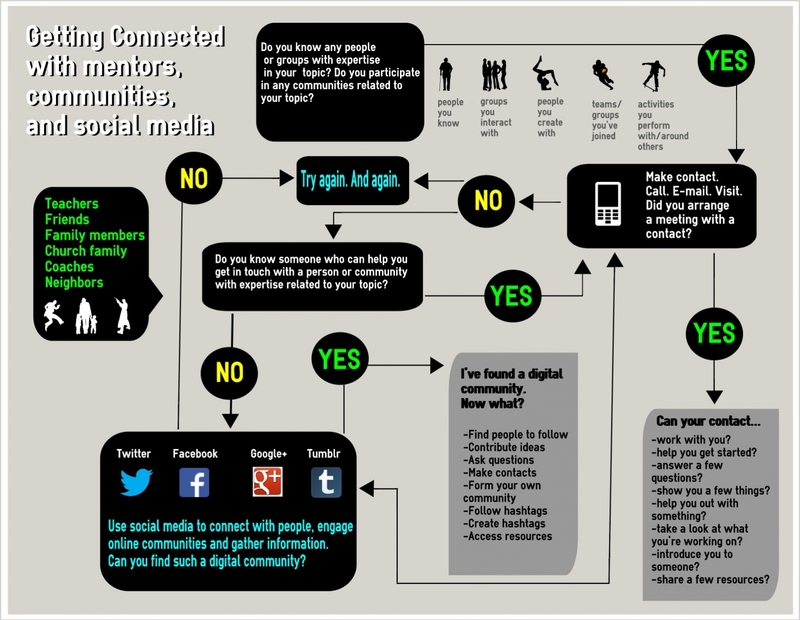 The map contains three major steps: finding (local, face-to-face) people or groups that can help you learn about your topic, finding people who can help you connect to such people or groups, and using digital tools for connecting and communicating with such people. At first, the map suggests an linear approach–if not this, then this…–but all paths include pursuit of both human and digital communities. Created using easel.ly after year one of Project Connect, the map seeks to expand and guide our conversations about getting connected in year two. I would like to imagine our students and teachers collaborating with this document as a tool, providing them with a common, and a concrete, pattern of thought, so that teachers can coach students through the process of making connections. I would like to imagine a girl who wants to learn to make sushi sitting with her teacher, this map as their centerpiece, figuring out how to connect with the human resources that can meaningfully guide the student’s learning process. If students learn to get connected, whether face-to-face or online, to the people and communities that can help them learn what they need to learn, make what they want to make, and be who they want to be, then they might just end up slightly better off when they leave us for the real world they’ve already been living in. And perhaps a delicious spicy tuna roll will come of it.